Chex Mix is such a fun and addictive party snack, so Nicole decided to make it even more irresistible by sweetening it up. 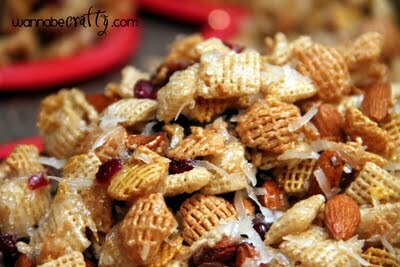 Head over to Wannabe Crafty and see what a little sugar and butter can do for your party mix. ohhh that actually looks really yummy! I LOVE Chex mix! Forget the pizza, I swear Chex mix is how I put on my freshman 15 in college! I was ALWAYS snacking on it when I studied!